Email is the most common method used to communicate on the Internet and is still widely being used today. One of the most annoying problems that a user can face when using their email is the received email shows that it arrived with incorrect date or time. Emails are normally sorted by the received date & time for you to easily view the latest new emails as they are shown at the top of the list. You would most likely miss an email that is dated earlier since it’s automatically moved down the list, while an email dated later would cause it to constantly appear at the top of the list. Hence, making sure that the emails you receive have a correct time stamp is very important. Many years ago you’d need to identify if you’re experiencing this problem in webmail or email client software because both use a timestamp from different sources. Webmail would get it from your online account settings while the email client software would read it from your operating system clock. Things have certainly changed today with most (but not all) webmail services able to use the date and time setting from Windows. If you are receiving emails that are few hours ahead or behind, here is how to fix it. Most of the giant email providers such as Gmail, Yahoo, GMX and Mail.com that power 270 different email domains already use the date and time from your operating system but weirdly Outlook.com or Hotmail still depends on the time zone setting from your Microsoft personal info account. You can access the time zone settings by signing in to your Outlook.com or Hotmail account, click on the cog wheel or gear icon located at the top right, and select Options. Click on “Account details (password, addresses, time zone)” followed by clicking on the “Edit” hyperlink on personal details. Alternatively, you can just click on the URL below to directly access the time zone settings page. Select your country and the list of time zones based on the selected country is available for you to choose. 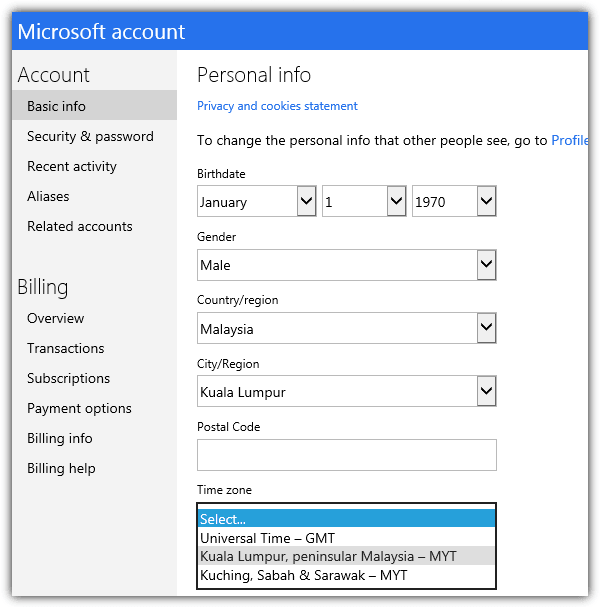 Click the Save button once you’ve finished changing the time zone for your Microsoft Account and the email timestamp on your Outlook.com or Hotmail will be updated to reflect on your new time zone. For email client programs such as Microsoft Outlook, The Bat!, Mozilla Thunderbird, Windows Live Mail, IncrediMail and webmails such as Gmail, Yahoo, GMX and Mail.com, all of them use the date and time settings that are configured in your Windows operating system. This actually makes more sense because the user only needs to update the time zone on their computer and every email timestamp automatically gets updated by itself without having to manually change the settings for every webmail. 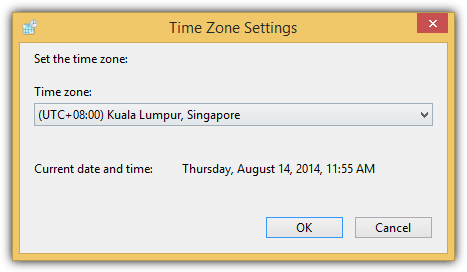 Here are the steps to change your date and time or time zone settings in Windows XP, Vista, 7 and 8. 1. Press WIN + R to bring up the Run window. 2. 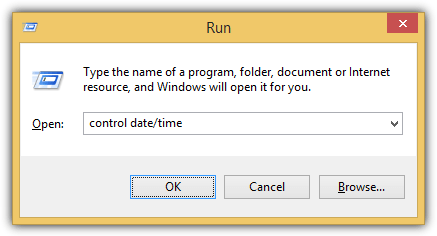 Type control date/time into the Run window and click OK.
3. Click the “Change time zone” button. 4. 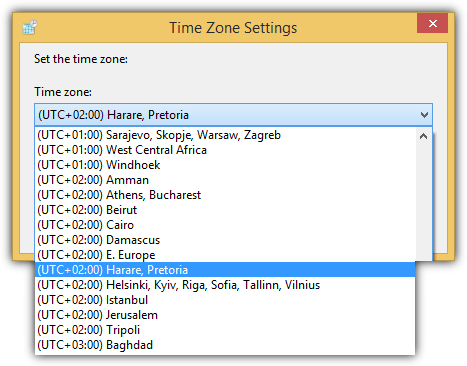 Select the time zone that you’re currently in and click OK.
As Windows does not show the full list of time zones, you may not know which one to select if you’re not familiar with zones especially if your city is not in the list. What you can do is look up the time zone for your country or city in WorldTimeServer.com and choose one in Windows that matches it. For example, the time zone for Malawi is +0200 UTC. In Windows time zone settings, the best selection would be Harare which is the closest to Malawi although it’s in a different country. 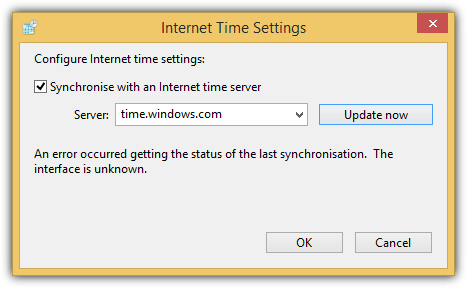 It is equally important to make sure that Windows is configured to automatically synchronize with an Internet time server so that the clock on your computer is always up to date with the time zone. Although this is enabled by default, the provided Internet time server in Windows is always overloaded or busy and you’d likely experience a time out error most of the time. What you can do to solve this problem is use an alternative Internet Time server that is less busy which you can find from National Institute of Standards and Technology (NIST) website. With the correct time zone selected and a working Internet time server configured in Windows, you will no longer have problems seeing emails with the wrong timestamp that are few hours behind or ahead. Additional Notes: If you are still having problems with the timestamp in Gmail after making sure that the time zone settings are correct, you might want to manually change some of the time zone settings in your Google account. It is reported that the time zone settings in Google Calendar can override the system clock for non Windows operating systems. Simply visit Google Calendar, click on the gear icon at the top right and select Settings. Pick your Country and the time zone for the selected country will be available for you to choose. There is also an optional time zone setting in your main Google account which is quite difficult to find as it is hidden a few levels deep. Fortunately there is a direct URL that you can access to change your Google account’s time zone setting. Thanks for your help dude!! Thanks for your help!! I kept changing the calendar settings in Yahoo but it does nothing at all to the email time stamp. Your article really solved my problem, thank you very much!! Thank you for your help. this information fixed my problem. i had no idea that i needed to change this also. thanks again!